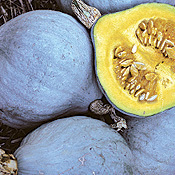 description for "Winter Squash and Pumpkins: Cucurbita maxima, 'Blue Ballet'"
Cucurbita maxima 'Blue Ballet' is a smaller version of the Blue Hubbard, only with a smoother blue-grey shell. 'Blue Ballet' is a 4-6 lb. fruit making it much more marketable than its much larger cousin. Sweet fiberless flesh that stores well. Planting depth: .5-1 inch. Days to germination: 3-7 days. 90 days to maturity. reviews for "Winter Squash and Pumpkins: Cucurbita maxima, 'Blue Ballet'"